Most of the Roman activity from Lambourn parish appears to have been in the Eastbury area. A highly interesting find is a bronze sceptre head in the form of a male bust. It may have been associated with a Roman temple whose whereabouts is, as yet, unknown. Perhaps it was the building on Stancombe Down, revealed by its roof tiles and floor tesserae; pottery, mortars and coins. Although this is usually interpreted as a villa. The graves of ten 4th century residents have also been found there. Eastbury must be one of the prettiest villages in Berkshire. It has many old and interesting buildings which catch the eye as you pass along the Newbury to Lambourn road. 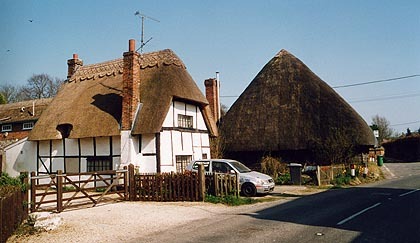 There are huge medieval thatched barns, little cottages and Jacobean farmhouses. Pigeon House Farm is named after its well preserved flint and brick dovecote with room for 999 pigeons! Both buildings are dated 1620. The red-brick manor is also 17th century and features internal panelling and a fine chimneypiece flanked by caryatids. As his name suggests, the family of the great Lambourn benefactor, John Estbury, who built the village almshouses, came from Eastbury Manor. His ancestor and namesake acquired it through a number of land transactions in the 1360s, during the lunacy of the rightful owner, Joan de Wanting! The little church of St. James only dates from 1851, but the village has a medieval preaching cross. In the 16th century, it was stated that "on Wednesday in the procession week the procession of Esbery goes to Gombelton Cross and meets Lamborne procession and then both come to Esbery chapel. . . . Then Esbery goes with them in to the Wodlond on Holy Thursday and the procession of Esbery goes to Wodebery Crosse and there tarries for Lamborne's procession."